The 2018 California Notary Handbook is the official authority when it comes to acts as a California notary public. 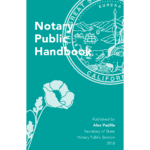 It includes all the new California notary law updates, references the actual codes and is also simplified in layman’s terms. You can download for free or order a hard copy to be mailed to you. New, updated versions are released around January-February each year. Also included in the download is the California Notary Application and California Notary Livescan Form.